The Kingdom of Jerusalem was a Christian kingdom established in the Levant in 1099 after the First Crusade. It lasted nearly two hundred years, from 1099 until 1291 when the last remaining possession, Acre, was destroyed by the Mamluks. At first the kingdom was little more than a loose collection of towns and cities captured during the crusade. At its height, the kingdom roughly encompassed the territory of modern-day Israel and the Palestinian territories. It extended from modern Lebanon in the north to the Sinai Desert in the south, and into modern Jordan and Syria in the east. There were also attempts to expand the kingdom into Fatimid Egypt. 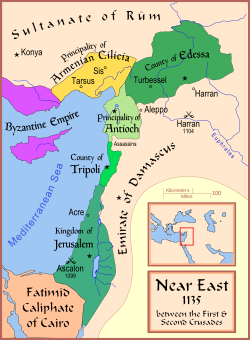 Its kings also held a certain amount of authority over the other crusader states, Tripoli, Antioch, and Edessa. On 22 July, a council was held in the Church of the Holy Sepulchre. Raymond of Toulouse at first refused to become king, perhaps attempting to show his piety, but probably hoping that the other nobles would insist upon his election anyway. Godfrey, who had become the more popular of the two after Raymond's actions at the siege of Antioch, did no damage to his own piety by accepting a position as secular leader. Raymond was incensed at this development and took his army out into the countryside. The exact nature and meaning of Godfrey's title is somewhat controversial. Although it is widely claimed that he took the title Advocatus Sancti Sepulchri ("advocate" or "defender" of the Holy Sepulchre), this title is only used in a letter which was not written by Godfrey. Instead, Godfrey himself seems to have used the more ambiguous term princeps, or simply retained his title of dux from Lower Lorraine. According to William of Tyre, writing in the later 12th century when Godfrey was already a legendary hero in crusader Jerusalem, he refused to wear "a crown of gold" where Christ had worn "a crown of thorns". Robert the Monk is the only contemporary chronicler of the crusade to report that Godfrey took the title "king".